Yen Bai is a mountain province, characterised by rugged mountainous scenery and green rice paddy fields in the valleys. The Hoang Lien Son mountain range runs through the province. The Red (or Thao) River and Chay River flow the province. Their origin is in the Yunnan, China. The valley created by these two river systems in the Yen Bai Province is fertile, though an uneven territory; Muong Lo plain is the rice bowl of the province. The topography is steep, rising from east to west and from south to north. The average elevation is about 600 meters (2,000 ft) above sea level and can be divided into two regions: low-lying regions on the left bank of the Red River basin and the high right bank of the Red River and in the plateau between the Red River and Da River there are many mountains. Besides the two main rivers, the Red and the Da, the province has about 200 canals, small streams and large lakes and swamps. Yen Bai is the gateway of Northwest, the home to the ancient Vietnamese with more than 30 ethnic groups, the Red River Delta civilization and the midpoint of interaction between Northeast and Northwest of the country. It has the attractive tourism potential with historical relics, temples, pagodas associated with the history in building and defending the country. Yen Bai tourism is not as magical and sacred as the ancestral land. It is not as spectacular as Silver Waterfall – Sapa, but bears a wild beauty fascinating tourists with a cool climate and natural landscapes. Famous natural landscapes here are rice terraces, Mu Cang Chai Species / Habitat Conservation Area, Suoi Giang tourist area at an altitude of over 1400m above sea level with climate similar to Sapa, Dalat; the steep cliffs with 300-year-old tea trees, immense Thac Ba lake dubbed Halong on mountain with thousand islands and wild caves, etc. Thac Ba Lake is one of three largest artificial lakes and known as an attractive ecotourism spot. The lake is wide nearly 20.000ha with 1331 islands. Go sailing through the islands, tourists can enjoy the cool climate of nature, contemplate the vast green forests between the poetic islands creating a charming painting of a mountain and river area. In addition to the charming beauty, Thac Ba is the home to 12 ethnic groups with diverse cultural colors of traditional festivals held in the New Year as Long Tong festival of Tay people, pray crop of Tay people, so on. Visiting here, tourists will also the chance to specialties of ethnic people with the fragrant flavor of com lam, banana flower salad, roasted pork, fish salad, etc. 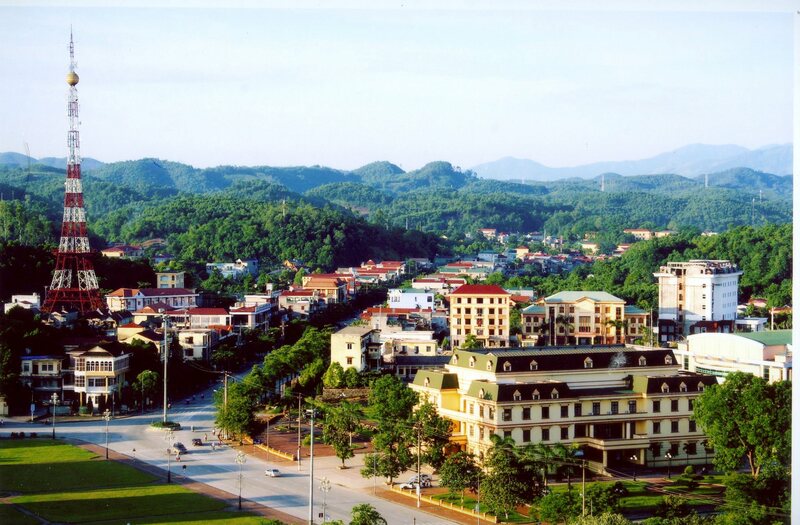 From Yen Bai city, along National Route 32 about 80km to the west, tourists will come to Muong Lo valley, Nghia Lo town. Muong Lo is the second large paddy field in the Northwest, famous for the sentences “the first Thanh, the second Lo, the third Than and the forth Tac". Among 4 well-known valleys thanks to the beautiful landscape and fresh climate in the northwestern region, Muong Lo is ranked after Muong Thanh (Dien Bien) and before Muong Than (Than Uyen, Lai Chau) and Muong Tac (Phu Yen, Son La). Look from the above, Muong Lo paddy field looks like a large pan surrounded by mountain covered by clouds year round. 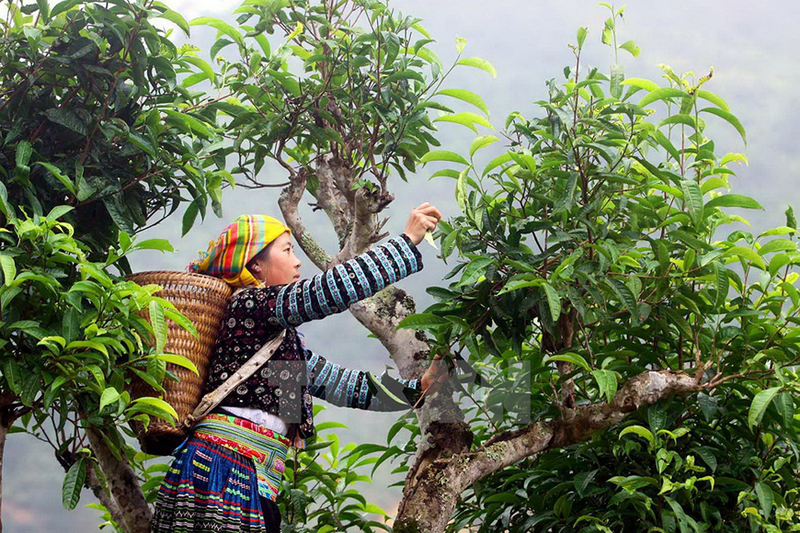 In addition to the specialties of the highlander as rau cai meo, chayote, tubers, fruits, cereals or straight Cunninghamia and po mu tree lines, the gravitational thing appealing tourists to Suoi Giang is the tea culture of Mong people. Coming here, tourists not only see the hundred-year-old tea trees but also taste the aromatic flavor hot cup of Shan Tuyet tea prepared by the hands of H'mong women and explore the simple and rustic lives of H'mong people under the mountain's foot. Suoi Giang- a hidden beauty is suitable for ecotourism, relaxing and learning about the local culture. 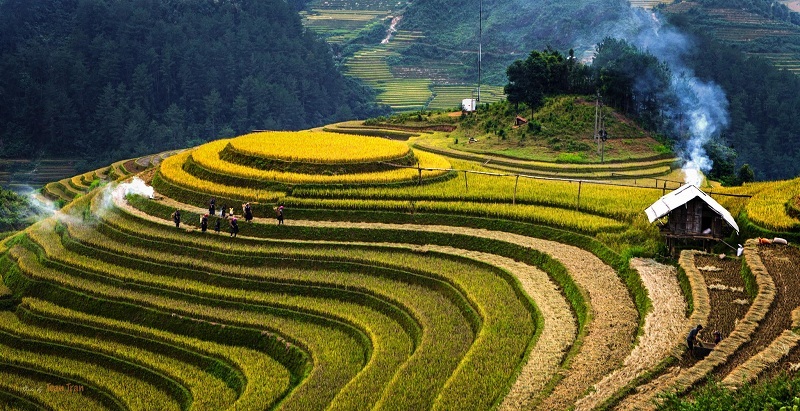 From Van Chan district, along the National Route 32 about 80km, tourists will arrive at Mu Cang Chai district that has spectacular rice terraces. To reach Mu Cang Chai, tourists have to pass through Khau Pha pass with 2100m high - one of 4 great passes in Vietnam. When setting foot in Mu Cang Chai, tourists will be surprised by spectacular rice terraces cultivated by the industrious hands and creativity of H'mong people. Coming to Mu Cang Chai in spring, look from the above, tourists will see here covered by the green color of new rice, of buds between the clouds and brilliant peach and plum flowers. The best time to visit the rice terraces is in September and October - the season of grain. Tourists will be extremely impressive with the image of "Golden Rice Bowl spreading endless. Visiting Yen Bai, tourists will have the opportunity to immerse into the unique spiritual cultural festivals and visit famous temples and pagodas as Ngoc Am Pagoda worshiping tam phu and Tran Saint, Tuan Quan Temple worshiping Holy Mother Lieu Hanh and Lam Son princess, Ba Chua Dang Temple, Nam Cuong pagoda. It is incomplete if tourists do not drop by Dong Cuong Temple, the temple famous for the sacredness in Van Yen district. The temple was built in a place with charming landscapes, harmonious mountain and river. Muong Lo cultural week: The Muong Lo Cultural Week held in the month of October in Nghia Lo town marks the anniversary of the liberation of Nghia Lo. Festivities lasting one week include sports competitions, Northwest Fair and a food and drink competition. The rite of maturity is an indispensable ritual of Red Dao people to recognize the maturiry of a man or woman. Along with many people in Yen Bai welcomes the New Year, Red Dao people in Phuc Loi commune, Luc Yen district hold the rite of maturity. This is also a ritual to pray for peace, luck, teaching Red Dao ethnic children the filial to their parents and grandparents, relatives. In addition, other festivals in Yen Bai also attracts tourists to participate in and learn about as Mau Thac Ba Temple festival, Doc communal house festival, Bung Lo festival (Dao Ho festival), Tang Cau festival of Blace Thai. The valuable trips to discover the land of legend ancient tea tree and the charming tribe hill of Dao people in Vietnam Northernmost.